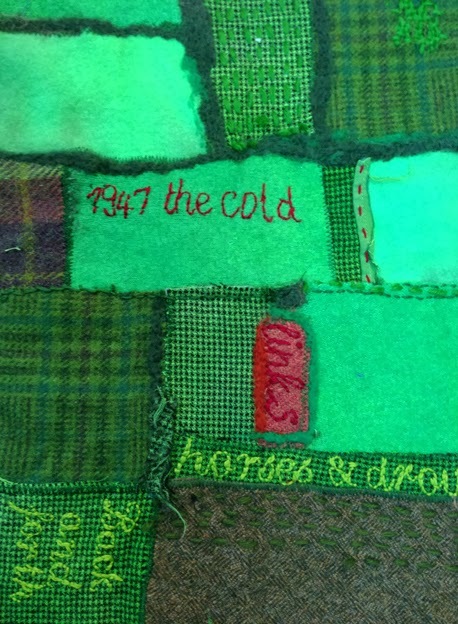 Thursday last, was spent on the project Stitching the Wars, with the In Tandem Group at The Farming Life Centre, up at Blackwell, in the Peak District. With me were three retired farmers and Carol the 'Health Trainer'. The session flew by as we discussed the memories of war time Derbyshire, and its impact on the land and people. From one gents ARP warden/publican dad, circulating gas masks round the village from his pub, to the fattening pigs for the Fight for Food, to Sterndale Church loosing its roof when a bomb landed, to stores of bombs as tall as men on Moneyash to Ashbourne Road, all finished off with beautiful descriptions of the colours that make up this area- 'the full flair buttercups'. During the session I shared the quilt samples I've been preparing for the sessions. 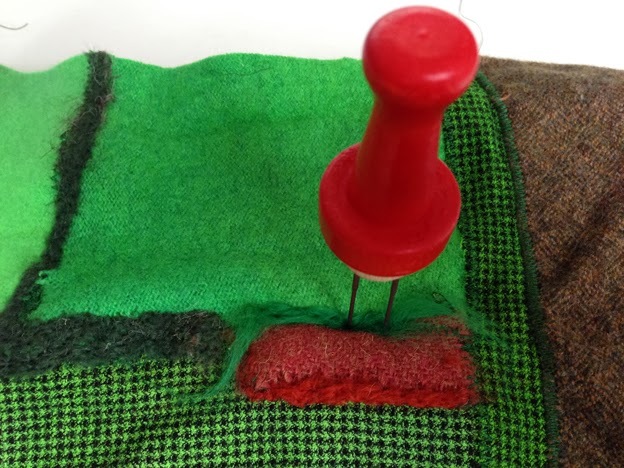 The wool quilt, uses a mix of fabrics associated with the countryside; recycled herringbone jackets and tweed trousers, jumpers that have been dyed and felted...I've used a range of techniques with the intention that there will be something for everyone to have a go at- whether that is selected fabrics to sit next to each other, or working on something more dextrous such as embroidery techniques, smocking or darning. The inspiration for the wool quilt has come direct from the Derbyshire landscape, field patterns taken with aerial photos or from hill sides. 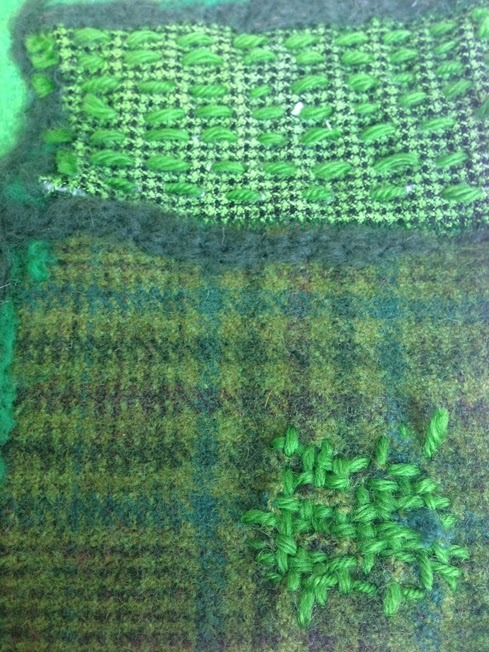 These will be stitched into with words, and abstract shapes, reflecting the memories and texture of the land. As with the pieced quilt that I've been sampling, my expectation is that the work will change and grow with the various groups that will work on the project. The nature of embroidery itself has been a rich subject matter for the groups so far, recalling when darning of socks was a necessity, stitching tablecloths a hobby, and careful embroidered samples made at school under the keen eye of the teacher- I'm sure my samples would have been frowned upon. 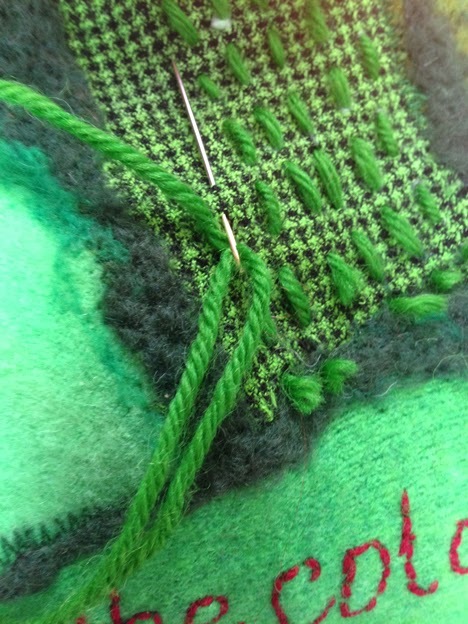 As an artist collaborating with groups to make new works, I need to find methods that suit my skills and my personality, the wool quilt is succeeding so far; I aspire to neatness, but fall far short, so have to adapt techniques accordingly. 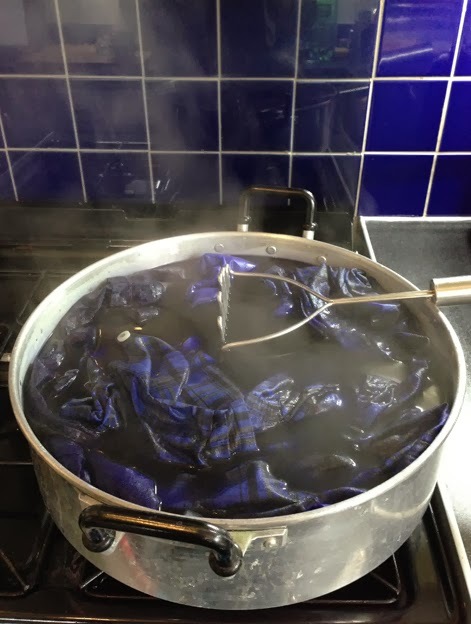 I have a love in colour, dying the fabrics for the quilts- a pile of recycled charity shop shirts and jumpers in co-ordinating violets or olive greens has brought me considerable joy. I'm experimenting with new techniques such as needle felting and re-visting a world of embroidery, half forgotten from my degree. What a delight.